Project obstacles and solutions: In 2015, Costco Wholesale announced its plans to build a new store and fueling station on 19 acres on Bardstown Road in Louisville, Kentucky. The site was previously occupied by an abandoned cinema, which was razed. Gray Construction was the general contractor on this project. This job had a fast track construction schedule. After tearing down the old complex and excavating the site, Gray had a mere 110 days from the pouring of the first footings until the store was turnkey operational. Any delays in the construction schedule were critical. IMI supplied 3,000 yards of concrete in 8 days straight for the floor of the 153,000 square foot building. IMI QC/QA was on site throughout the pours to ensure that the concrete was meeting specifications and IMI plant personnel made sure that trucks were loaded and spaced to keep the job moving. With so much construction happening at once, safety on the job site was paramount. A fully loaded concrete mixer truck weighs in excess of 40 tons. Drivers were made aware of equipment and workers moving around the site as they poured. IMI completed this project without any safety incidents. Broughton Concrete handled all of the flat work on the inside of the building. Southeastern Concrete poured all of the footings and Fox Enterprises did all of the curbs and concrete paving in the parking lot and walkways surrounding the building. 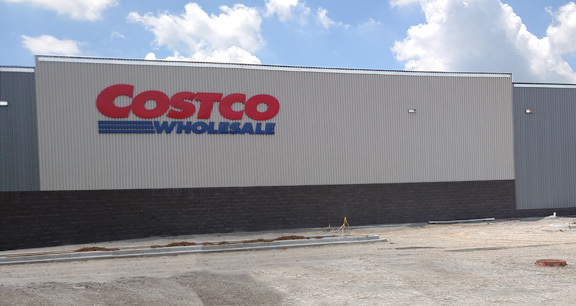 The Bardstown Road Costco is scheduled to open at the end of the summer of 2016. For more information on delivering concrete on fast track jobs, contact the sales representative for the concrete plant nearest your location. Click here.